During your bioregional session at the Permaculture Convergence in September, I think that either you or your co-presenter mentioned that one of you (him I think), had done some mapping of bioregions in the UK. Have I got that right, and if so please could you point me towards him? Or do you know of any other sources of geographical definitions/boundaries of bioregions in the UK? A quick google search has not yielded. I’m doing some thinking for Ctrl-Shift / the Permaculture Association with a view to mapping the Ctrl-Shift partner organisations and participants. Bioregions seem appropriate. ‘I’m not sure that Ed Tyler or I suggested we’d done mapping of the UK’s bioregions – but Ed has certainly done some work on ways of thinking about bioregional divisions of Scotland which may be what you remember. This is a fascinating topic and starting to model organisations etc. from a bioregional perspective begins to test how useful (or not) this concept is and opens up questions that it is useful to ask. Some, folk believe that bioregions exist a priori and are discrete units which just need to be identified and named. In that camp a basic model for England (and parts of Wales) is the Environment Agency’s ‘River Basin Districts’. Scotland’s river basin districts are indicated on the map on p.6 here [pdf], Wales’s here, Ireland’s here. An alternate but compatible methodology to the same ends might be the ‘catchment-based approach’ of the local rivers trusts. A Phd thesis published by Jonathan Ball in 1999 looked at Scottish bioregions: ‘Bioregions and future state visioning: a visually integrative approach to the presentation of information for environmental policy and management‘ this includes suggestive maps of Scottish bioregions – but also reveals the potential complexity of doing so. I’m not in the camp that considers bioregions to exist a priori, as I think that there are socio-cultural elements to their definition, and ‘more than watershed’ delimiters, which make them best understood as emergent phenomena – although a river basin/catchment model is not a bad place to start. Ed and I live in coastal regions which add another layer for consideration (worth more attention as the Atlantic Archipelago is highly coastal) . If you want more ways to think about how these islands might be considered as a grouping of smaller units (and sense common patterning), then a browse through the maps in the image section of my FB group Confederation of Soviets of the Atlantic Archipelago (CSAA) will be worthwhile. If however, as seems likely! you want a model to try and apply tout de suite – go with river basins! The river basin/catchment approach I wrote about in my reply clearly aligns with the watershed thinking of bioregionalism v 1.0. Also, a native tradition of such organising in these islands might be traced at least as far back as Frederick Toplis’s ‘Suggestions for Dividing England and Wales into Watershed Districts’ in the Journal for the Society of the Arts, No. 1369, Vol. XXVII (July 4 1879). [his suggested divisions were not for general governance purposes but for regional water authorities]. In addition it has the advantage of using units recognised by existing governance authorities, which eases communication with officialdom and alerts us to the potential allies in the Rivers Trusts and others local waterways stakeholders like the Essex Rivers Hub. Catchment authorities were mentioned in the ORFC session on ‘Landscape Scale Land Management’ I wrote about in a previous post where one of the possible ways forward suggested was: ‘Use the work of Catchment Partnerships and other water / flood management planning processes as a vehicle to develop and expand the conversation regarding landscape management for multiple benefits.’ In that session I also introduced the possibility of building on the ecological scope of those authorities by associating them with local emergency resilience forums and then on to chambers of commerce – with the resilience narrative providing a connecting fluid and shared lexicon that might assist bioregional scale praxis. 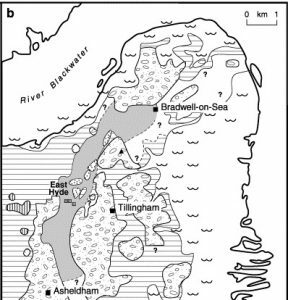 The Dengie peninsula is completely outside the recognised watershed/catchments as it drains directly into estuarine waters. Once you start thinking about coastal/estuarine waters, the importance of the sea in bioregional thinking for these islands becomes apparent and here around the Dengie we have the newly designated ‘Blackwater, Crouch, Roach and Colne Estuaries Marine Conservation Zone‘ which begins to give a shape to a hydrographic element of the Dengie Bioregion. I do think there is value in watershed cartography and mapping bioregions according to definable geomorphology is a worthwhile act. Anthony Melville has done sterling work of this type for the ‘Oxford Bioregion’ and its upper Thames watersheds. I have repeatedly heard a desire for a ‘map of the UK’s bioregions’ expressed and within the Bioregional Community of Practice there is interest in leveraging powerful digital mapping tools like those of Land Explorer and Geovation in order to create a definitive atlas to that end. I guess I still feel a heretic, with opinions somewhat contrary to this doctrine – that they miss the important cultural element of local distinctiveness that Common Ground expressed so well. I also feel that we might best find the appropriate boundaries of our life-places by moving slowly upwards from the parochial and the biotype, and discover the edges of the bioregion that way rather than by surveying downwards from the ecoregion and watersheds.